Database Manager for Excel is a database management Excel add-in enabling to store, edit and retrieve data from Excel as a database application. Database Manager for Excel is the ideal tool to meet data management needs for data stored in Excel worksheets or Excel lists. Database Manager is an Excel add-in that enables the transformation of worksheets into tables and creation of customized forms all within the familiar Excel environment. The Database Manager has a robust set of data validation options to ensure that only valid data is added to your database. 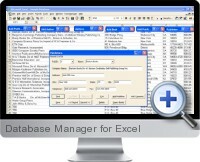 Database Manager also leverages Excel's numerous database related features for further data analysis and reporting. Existing Excel Data Lists can be quickly and easily converted into Database Manager tables. For efficient business mailing, data stored in your Data Manager database can be used as the source for Mail Merge in Word to quickly and easily generate letters, invoices, mailing labels, envelopes and contact directories along with e-mail and fax distributions. Database Manager for Excel uses a wizard-like process to walk the user through the steps of creating a database and associated forms. A comprehensive help file that comes with the software details how to use advanced features. Database Manager for Excel provides the user with a number of valuable features. A simple database with a single table or a complex database containing multiples tables (up to 20) can be created. Relationships can also be applied between tables. In addition to the ability to create multiple tables, multiple customized forms can be created for each table. Each form consists of fields (from a single or multiple tables), customizable command buttons, and/or user-defined labels. Database Manager for Excel offers a wide range of different types of controls for data entry to choose from including list controls and check boxes. Along with the typical database related tasks (e.g. saving data), command buttons can be assigned functions that provide added capabilities to interact with the database or the Excel environment. For example, a command button could open another form or run an Excel macro. Users with knowledge of Visual Basic for Applications can create macros for command buttons that read data from a form, process that data and then return data to the form. Database Manager for Excel also includes a query reporting tool that allows you to display data that meets a particular criterion. Data entered inaccurately into your database can be detrimental for any business. Database Manager for Excel provides several methods for ensuring that the data is entered correctly the first time. Input controls restrict the user to entering certain data or data of a specified type. For example, drop down list boxes can be configured so that the user can only select data from a pre-defined list or e-mail controls that only accept data in e-mail format. Data validation settings limit data to a particular data type, within a particular range, or in relation to a particular value. These include the Numeric data type which prevents the user from entering data that is not in a numeric format. Sorting tables by any combination of fields in ascending or descending order. Filter data by any combination of fields. Import data from multiple sources. Create fields that contain formulas. Group data according to specific criteria. Advanced data selection using Microsoft Query.